Amino AcidsTrec Leucine Fusion - 90 kaps. Trec Leucine Fusion - 90 kaps. High-quality matrix most biologically active forms of L-Leucine - one of the strongest amino acid with anabolic and anti-catabolic. Highest quality at an affordable price! Turn up your gains to the maximum! Trec Leucine Fusion - 180 kaps. Trec Leucine Fusion - 360 kaps. TREC LEUCINE FUSION is a high quality matrix of the most biologically active forms of L-Leucine - one of the strongest amino acid with anabolic and anti-catabolic. Numerous scientific studies confirm that L-Leucine helps the process of building and regeneration of muscle proteins at the same time. The unique combination of three different forms of the amino acid allowed to obtain a product with exceptional absorption and effectiveness. Supplementation TREC LEUCINE FUSION stimulates the building of muscle mass can increase performance and endurance during prolonged efforts and speed up the process of recovery time. FROM NOW YOU dictate the muscles CONDITIONS! Forget half-measures! If you care about really fast growth and the construction of the monstrous muscles that you can not afford to poor preparations! If you train really hard and eat well you deserve something more! Specially we created for you LEUCINE FUSION - an extremely strong product that allows you to maximize the effects of training. From now on your muscles have the best possible conditions for growth. The end of the stagnation! End of the lack of strength and endurance! A new era! Era LEUCINE FUSION! L-Leucine is one of the group of branched chain amino acids (BCAA), which ensures its extremely high nutritional value. Unfortunately, our body is not able itself to produce this extraordinarily active molecule, so we need to provide it with food. Leucine, as valine and isoleucine have a branched side chain, and therefore is absorbed directly into the bloodstream, bypassing the liver and quickly reaches the muscles. Really great metabolic role of leucine has been recognized by millions of athletes worldwide, and scientists confirmed its multidirectional effects on the body charged with intense physical exercise. High levels of this amino acid in the body stimulates the same time building processes (anabolism) and inhibit reactions leading to destruction of muscle structures (catabolism). Therefore, Leucine supplementation can in a relatively short period of time to improve, most of the exercise, increasing the effectiveness of diet and heavy training. 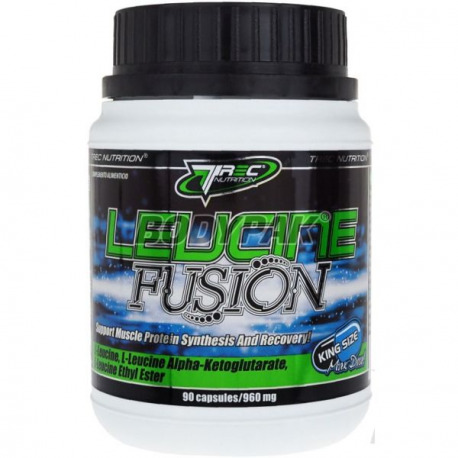 Included in LEUCINE FUSION Leucine plays a key role in the process of protein synthesis in muscle cells. It is high levels of this amino acid in the body is perceived as a signal to start and intensify the process by which our muscles grow and repair themselves. The appropriate dose of Leucine can increase the intensity of building new muscle proteins by up to 70%. Consuming large amounts of the amino acid allows for sustainable and stable progress in building high quality muscle mass. This amino acid not only increases the number of signal compounds that stimulate formation of muscle proteins, but also he becomes the first element in the structure of the emerging protein. Not without significance is the impact of Leucine on the level of secreted anabolic hormones. Its supplementation helps increase the levels of insulin and growth hormone. This improves the use of all supplied with the diet of nutrients - particularly protein and carbohydrates, and muscle cells receive extra stimulation for growth. TREC LEUCINE FUSION contains 3 excellent form L-Leucine - an amino acid which not only speeds up muscle growth, but also improves metabolism okołotreningowy. Use of the product before training can significantly increase the amount of useful energy required for heavy exercise. The product also helps to dismiss the feeling of fatigue since leucine inhibits the secretion of serotonin. This action translates directly into increased strength and power, and a marked improvement in endurance training. 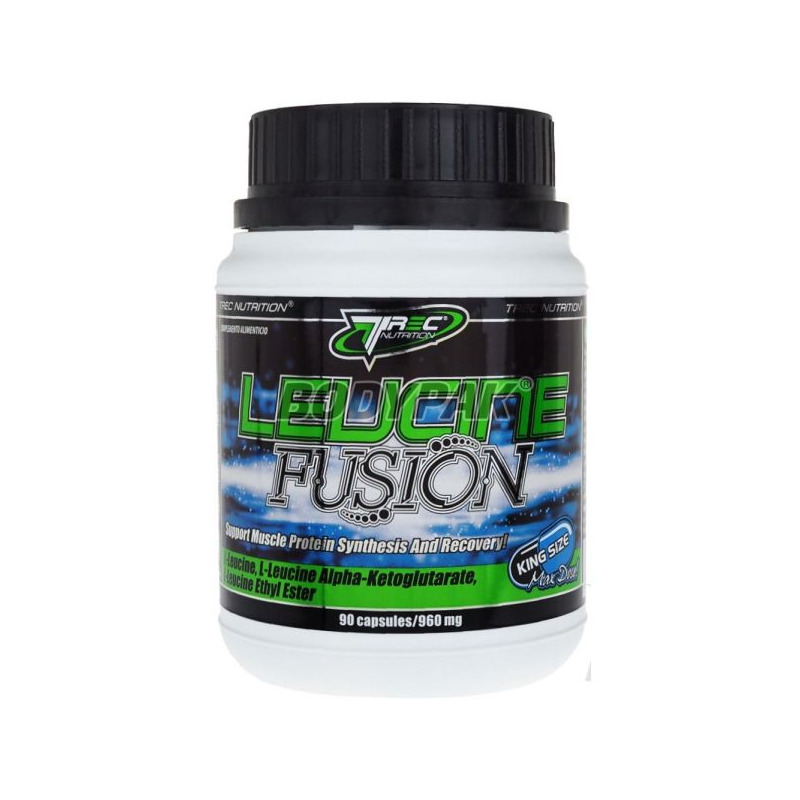 LEUCINE FUSION allows you to practice longer and at high speed. FULL PROTECTION catabolism TREC LEUCINE FUSION is a product of an extremely potent anti-catabolic, which helps protect muscle tissue from degradation arising as a result of the long and heavy exercise energy shortages. Leucine delivered externally may serve as an alternative source of energy, when glucose supplies run out. This saves protein muscle building from destruction. In conditions of energy deficit leucine accelerates the mobilization and burning of stored fat, maintaining high intensity training and further limiting catabolism. After training, high level of leucine accelerates postprandial regeneration of muscle protein and glycogen. This amino acid stimulates the production of insulin, so the speed with which they are provided the necessary nutrients after exercise dramatically increases. With Leucynie it is possible to achieve over compensation and full of nutrients replenish the glycogen, making the process of regeneration after training faster and more efficiently. FUSION THE BEST FORM LEUCINE TREC LEUCINE FUSION is a new generation, which contains up to 3 synergistically acting forms of Leucine. The product is the result of collaboration of experts from TREC NUTRITION's top players TREC TEAM. Already the first tests have shown remarkable anabolic and anti-catabolic power. The use of 3 forms of leucine in one preparation helps to dramatically increase its efficiency and speed. The carefully selected proportions of ingredients and the high dose make LEUCINE FUSION the most effective leucine matrix ever created, available at an extremely attractive price. WHO IS RECOMMENDED PREPARATION? TREC LEUCINE FUSION is a product designed for both professional athletes and amateur sports strength and sculpting and endurance, and endurance athletes. Preparation will be the perfect complement to the diet, which improves the utilization of protein and carbohydrates in the process of recovery time. LEUCINE FUSION will help you break the stagnation and accelerate progress in building basic features of stress in all sports. In bodybuilding preparation drastically accelerate the construction of high quality muscle mass. TREC LEUCINE FUSION - BEST FORMS OF ANABOLIC amino acid! The recommended daily allowance is 2-3 capsules 3 times a day, drink preparation 300 ml of water. serving in the morning after waking up, serving 30 min. before training and one serving immediately after training. serving in the morning after waking up, one portion between meals, serving just before bedtime. Wartość odżywcza 100g 9 kaps. 3 kaps. 1 kaps. Dodatkowe składniki: stearynian magnezu (substancja przeciwzbrylająca), wieprzowa i wołowa żelatyna (kapsułka). MEX Amino 12K [Sport Line] - 120 tabl. Top-quality product that each serving contains all the amino acids that your body needs only. It contains amino acids BCAA, accelerates regeneration and inhibits catabolism!